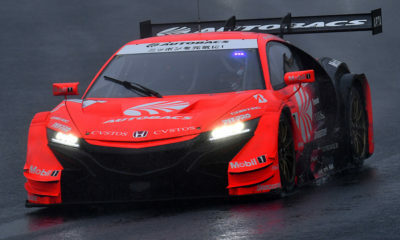 KEIHIN Real Racing secured first position in the Super GT season-opener at Okayama on Sunday with its Honda NSX-GT, ahead of the Team Kunimitsu car of Jenson Button. Koudai Tsukakoshi and Takashi Kogure started from pole position in the KEIHIN car and remained out front in the first lap, while Ronnie Quintarelli moved from eighth to second in the Motul Autech Nissan GT-R. Newcomers Felix Rosenqvist and Button struggled in their opening stints, dropping down the order while lapping GT300 cars. The KeePer Tom’s Lexus LC500 of Ryo Hirakawa and Nick Cassidy made its way to the front and caught the leading car on lap 32, passing the Honda at the hairpin. The Lexus soon lost the position with a slower pit stop a few laps later, however. Button pitted earlier than his rivals to hand the car over to Naoki Yamamoto, with the team deciding not to change tires, helping it to emerge out front. It was then passed by the KEIHIN car, benefitting from new tires and although debris got caught in its front bumper, Yamamoto was unable to take the lead. Tsukakoshi therefore won the race ahead of Yamamoto in a Honda 1-2, while debutant Button scored his first podium since the 2012 Formula 1 Brazilian Grand Prix. Reigning champions Hirakawa and Cassidy completed the podium. The GT300 class win went the way of the UpGarage Toyota 86 MC of Yuhki Nakayama and Takashi Kobayashi.